TL; DR: Created a month before the World Wide Web — yes, really — IMDb has since cultivated an online and mobile audience of more than 250 million unique monthly visitors. Equally fascinated by technology and movies, Founder and CEO Col Needham built his personal registry of watched movies into the Internet’s most popular and authoritative source for movie, TV, and celebrity information. With the likes of Steven Spielberg and the showrunners from Game of Thrones avidly searching IMDb’s database of more than 185 million movies, TV shows, and cast and crew members, IMDb has grown from satisfying fans’ curiosity to also playing an active role in connecting actors, filmmakers, agents, and casting directors. As with many of the tech entrepreneurs we write about, Col Needham started his own company as a teen. His heart, however, wasn’t in computer games software; he was obsessed with movies. Starting in the early 1980s, Col kept a diary to track the films he watched and who made them. The paper registry lasted a whole two weeks — why write this when he could create a database on his computer? An unabashed technology nerd, Col was 12 years old when he built his first computer in 1979. He boasts about having an email address in 1985, but the earliest version of IMDb has been around even longer — Col started his database in 1981. Originally, the database was just the name of the movie and the date when he watched it. Soon, each entry grew to include the main actors, the director, crew members, a 1- or 2-sentence summary, and what he thought of the movie. Now, IMDb boasts more than 185 million data points of entertainment industry facts and faces and reaches more than 250 million unique visitors each month. More than just a searchable database, IMDb plays an active role in Hollywood by tracking box office revenue and connecting actors and filmmakers to the producers and film festivals that can boost careers. Col shared his movie list online in the late 1980s. He had found a group of like-minded cinephiles in Usenet, a sort-of virtual bulletin board meets current web forums. Users shared their own lists with Col or offered suggestions. One of the contributors asked the game-changing question: What if we made this database searchable? Col converted the database software he created into Unix shell scripts that would search the database and work on any computer connected to the Internet. Nine years after starting his original database — before the first web browser even existed — he shared the software online for all to use. From 1990 to 1993, IMDb existed as a software program users would download and install on their own computers. As more people got online, they would find the database and sometimes contribute additional information. 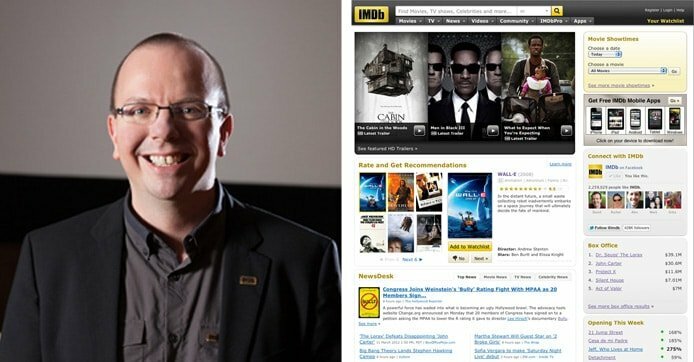 For more than 35 years, movie fan and UK native Col Needham has cultivated the database that turned into IMDb. IMDb became one of the first 100 websites on the Internet in 1993, the year the first web browser became widely available. Following the website’s launch, IMDb’s previously steady growth skyrocketed exponentially. The surge of traffic convinced Col, who was working full-time at Hewlett-Packard, to invest more time and resources into his side-project passion. He incorporated IMDb as an LLC in 1996, and began to sell advertising space on the website. Among the first advertisers, 20th Century Fox signed on to promote Independence Day. A few years later, Col met with another advertising partner: Jeff Bezos and Amazon. The online marketplace wanted to start selling VHS tapes and DVDs, and they wanted a partner. Given Amazon’s resources and IMDb’s mounting collection of data, Col agreed to let Amazon acquire IMDb (the terms have never been disclosed), as long as he could stay on board as CEO. Since the acquisition by Amazon, IMDb continued morphing from a developer’s side project to a fully fledged and thriving business. As with the web and websites, IMDb stayed at the forefront of technology by launching their iPhone/iPod app in 2009 and iPad app in 2010. That year, Steve Jobs praised the app in his keynote address at the iOS 4 launch. Windows and Android apps followed that fall, along with a mobile website. Less than a year later, the apps had been installed more than 21 million times around the world. Entertainment professionals began using IMDb to find new talent, prompting the team to create IMDbPro, a commercial subscription that Col said allows the company to cater to two very different audiences: the industry and the fans. Subscribers can find contact and representation information for potential cast and crew members, along with the proprietary STARmeter and MOVIEmeter, two rating systems that track the popularity of people and films over time. IMDb acquired two websites in 2008 to further bolster the tools available to industry pros. Withoutabox allows independent filmmakers to submit their work to film festivals and the like. Festival organizers can request and manage submissions electronically instead of the traditional route of sending DVDs through the mail. Withoutabox generates the film’s IMDb title page and enables streaming if chosen. Filmmakers can also sell DVDs and downloads on Amazon. Acquired six months after Withoutabox, Box Office Mojo tracks weekly and historic box office revenue and organizes the data by time, studios, actors, genres, and other metrics. The data surrounding a movie or actor’s success then gets fed back into IMDbPro’s STARmeter and MOVIEmeter, completing IMDb’s full Hollywood industry experience. On the fan side, IMDb debuted X-ray on the Kindle Fire products in 2012. Amazon Video viewers, while watching on a mobile device, can tap the screen to look through IMDb’s information about the movie, TV show, character, actors, and even the song playing in the background. Even as someone who recently announced watching his 10,000th movie, Col is still very much a starstruck fan — but so, too, are many of Hollywood’s elite. A few years ago at an Oscars after party, Col eagerly anticipated meeting his hero, Steven Spielberg. Col nervously rehearsed in his mind what he would say to his idol, but it was the acclaimed director who spoke first. “He grabbed hold of my hand and said, ‘Oh, wow, it’s such an honor to meet you. I use IMDb all the time. In fact, I’ve been using the app during the ceremony tonight.’ It was such a compliment and such an honor,” Col told The Independent.